The Nikon D3200 DSLR is ideal for new users, thanks to Nikon's DX-format CMOS sensor and EXPEED 3 processing engine that help to deliver exceptional pictures, and a dedicated Guide mode to help you shoot better. With a large Nikon DX-format CMOS image sensor and 24.2-effective megapixels resolution, the Nikon D3200 delivers remarkable pictures in their natural brightness and textures. Images are shot in NEF (RAW), JPEG, EXIF 2.3, DCF 2.0, or DPOF. Furthermore, this Nikon DSLR is capable of full HD video recording. The Nikon D3200 DSLR is equipped with the high performance EXPEED 3 image processing engine ensures impressive image quality and a speedy performance. This DSLR is capable of fast continuous shooting at approximately 4 frames per second, so you can capture fast action moments without ever missing them. Moreover, the camera features 11 focus points that helps you achieve sharply focused images. The camera offers plenty of in-camera editing tools that help make your photos look better. The Nikon D3200 has a 3-inch TFT LCD monitor which has a resolution of 921K dots. This VGA display monitor has a 160 degrees viewing angle and an approximate 100% frame coverage. Also, the camera is equipped with an eye-level pentamirror viewfinder. The Nikon D3200 DSLR comes with ISO sensitivity range from 100 to 6400. Moreover, it can be set to 12800, especially while shooting in extreme low light situations. The scene recognition system recognizes scene conditions before capture, thus resulting in exceptional photos. The scene auto selector selects the scene mode automatically by observing the subject or situation. 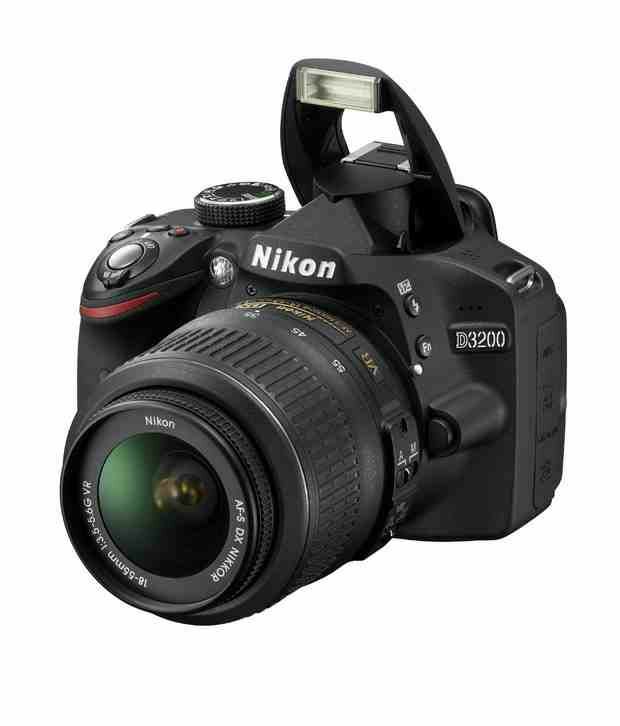 The memory is upgradeable on the Nikon D3200. The camera supports SD memory cards. Also, it is SDHC, SDXC, and UHS-I compliant. This Nikon camera is powered by a rechargeable Lithium-ion battery. The Nikon D3200 comes with a Guide Mode. Guide Mode is your in-camera assistant that will help you to change camera settings based on your scene or shooting requirements.